Zach is out of the operation and the surgery was successful. After consulting with our doctor midway through the surgery, it was clear the removal of Zach’s left eye was the wisest option to arrest the growth of the cancer. The growth had already spread to consume over 80% of his left eye. As far as we know the cancer is completely contained in that left eye. With that eye removed, we are hopeful that we have successfully removed the cancer in its entirety. Secondly, and most importantly, Zach’s right eye looks completely healthy. This means that the cancer was only in the one eye and not both. There is a big difference between one eye and no eyes! Lord willing, he will have one healthy eye to give him ongoing sight through his life. Zach will have many challenges ahead–regular exams of his right eye to scout out any cancerous growth in that good eye, learning to adapt to using one eye. We are thankful that God will be with him (and us) every step of the way. The surgery today included a sampling of spinal fluid and bone marrow sample to look for any evidence of cancer elsewhere. Please join us in praying that there be no cancer anywhere else. We haven’t seen him yet. Please pray for us as we know that this will be the beginning of a very hard reality that will take a long time to adjust to. Pray for God to sustain us today emotionally, spiritually and physically. Yet, in all, we are so blessed! Here in the hospital, we see many others whose troubles far surpass our own. Our hearts go out to them. PS. I’ve included a picture below of the exam under anesthesia of Zach’s eyes. The one on the top is his healthy eye (right), the photo on the bottom is the eye with cancer (his left eye). As you can see the radical difference between the two is extreme. We’re thankful for the healthy eye. Oh bless his little heart what a little fighter already! Yes thank the Lord the other eye is healthy. Prayers and thoughts to your entire family. Praise the Lord for the positive results of the surgery. We were saddened to hear of Zach’s condition, but we have faith in a mighty and gracious Lord. Our prayers will continue to be with you, Sarah and the girls. Praise God for the successful surgery. Praise God for Zachs healthy right eye. Thank you for your update. We continue to pray….. that ALL of the cancer was removed today, that Zach will recover and heal quickly from all that he has been through today and that you will heal emotionally from all that you have been through today. We love you all and are BLESSED by your faith and deep love for Christ. Thank you Sarah and Tim for sharing this day with so many, I really appreciated your posts. You all continue in my prayers. I praise God for His work today and every day in Zach’s life. The Brown Family is greatly loved and uplifted in prayer. I am writting to tell you our story of Our daughters eye. Like You, We went through a perfect pregency, without any problems we thought… I had been exposed to cat feces this was before the warnings that they now put out, and I had caught toxoplasmosis and did not know it so when Elisabeth started Kindergarden she started telling me “I see two of you mommy” so I took her to a pediactric opthomologist to find out that she had a hole in her retina, she is pretty much blind in her left eye, Liz never knew the difference so she coped well, she learned to read before she was three, so God has Zack all covered in His Grace! I will continue to pray for you all, God is good and He will bring you through this! Thank you for the updates, Tim and Sarah. I can only imagine. We love you guys so much and are praying for sweet Zach. What a fighter indeed. May God’s hand be on him and never leave him. Praise God the surgery is over and a success! Thank you both for letting us share with you a snippet of your journey so we could join you in prayer and support for Zach. It is our privilege to pray for all of you and to receive the reports of how the Lord is working in your lives during this life changing challenge. We claim healing for little Zach and for the future adjustments that he faces. We join with hundreds of your extended church family in lifting you up to the Lord for continued comfort and strength. Praise be to God for the healthy eye! We continue to pray for little Zach and his recovery as well as the continuance of God’s mercy upon him. We also pray for the two of you for the emotional strength you will need to watch your little one as he begins his recovery. God is all ready at work in his life. We lift your entire family up in prayer and join you in thanksgiving for God’s eternal grace and mercy. Thank you for sharing your strong faith with all of us. May God’s Blessing continue to cover you all! So happy that we can be praying for you all and so glad for the technology and skills of those placed in the position to care for your precious bundle. We love you guys so much and look forward to meeting your Miracle Zach in the next couple months. Continuing to pray, as I know so many people are. Thank you for your tremendous witness to all of us. I praise God for your enduring faith! I have forwarded prayer requests to other church’s prayer chains as well. I can tell you first-hand that God watches over little ones with cancer. My brother is a survivor of nearly 50 years and we praise God for his survival & His faithfulness! What a blessing; I saw Pastor Tweedy in Meijer’s this morning and he reminded me of your blog. 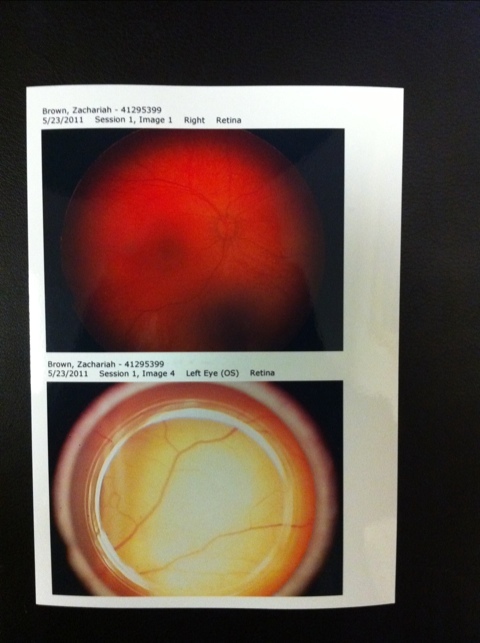 It is so reassuring to see that Zach’s surgery is completed and that God has given him a healthy eye. I will keep praying for a good prognosis on all other counts. It was so wonderful to feel all those prayers lifted to the Lord around 9 this morning. Loving Father, we pray that you will carry Tim & Sarah; that you will sustain them in every way today as they have asked. In Jesus’ Name. Please know that we love you dearly, and that our prayers are before “the throne of grace” for you, Zach, your family, and the doctors. Praise God the surgery went well. God’s abundant peace, comfort, and healing be upon you all. Praying that our Great Physician will continue to do His work on Zach’s behalf, and that our Heavenly Father will gather you all in His arms, and hold you close. Praying too for understanding and comfort for your girls, & that they will grow in their faith, as they watch you, and experience God’s care. PTL for successful surgery, and continued prayer for Zac’s recovery. We love you guys. It was a joy to spend the afternoon with your beautiful girls. We wil continue to pray. Dear Tim and Sara, We have you and the family in our prayers. We send our love and a few warm hugs. Our family has gone through living with our precious grandaughter Liz who had sight in one eye. She has been amazing in what she does and we thank the Lord for that. We went for a time not even knowing what was wrong. Your little one is being prayed for and the Lord loves him even more than we do so rest in His hands and as He holds your family in His arms through this time. We love you. What a joy to be able to pray on behalf of Zach and your entire family! Praising God for his faithfulness! How Great is our God! Your e-mails are so encouraging. I am praising God for how things are going, and I am especially thanking Him for Greg Dootz. A kind, compassionate artist who will help Zach as he navigates through updating his prosthesis. I know you dearly love Zach and your girls. It comforts me to think that as God’s children, He loves us even more than we love our children! Now that is love.